The fuel is sucked up from the tank by the fuel lift pump. When the piston is in the lower position, the fuel injector injects a very small amount of fuel into the cylinder under a pressure of >200 bar. When the piston moves upwards, the fuel-air mixture in the cylinder is ignited by the increasing compression. 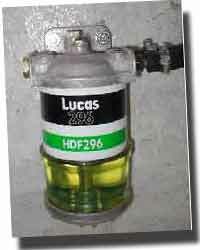 Excess fuel supplied by the fuel pump will return to the tank via a return fuel line. There will be a constant circulation of fuel when the engine is running. After maintenance (f.i. changing the filter element) air in the fuel lines can be removed by manual operation of the fuelpump before engine start-up. During circulation, the fuel is passing the filter all the time. The filter element is collecting the moisture and fine particles from the fuel. Any waterdrops sucked up from the tank will agglomerate in the glass reservoir. Due to a higher weight, water will be will be visible in the lower part of the transparent bowl and can be drained via the drain plug in the baseplate. I installed the fuel tank under deck on a bulkhead between the engine compartment and the storage compartment. This 25 liter tank is very suitable for small sailingboats. Because of the very efficient fuel consumption of the 10HP diesel engine, it will take a long time to empty the tank completely. The fuel level is visible through the hard plastic tank surface. The fuel is refreshed a few times during the season, so no very old fuel is remaining in the tank when the boat is stored during the winter season. The tank itselve is made of very stable material and will not couse any debris going into the fuel. 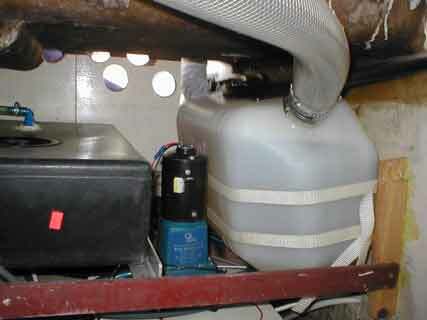 Air sucked-in via the ventilation opening will replace fuel used. Water vapours within the air are condensating in the tank. Because of its higher weight, water will sink eventually to the bottom of the tank. During day and night temperature changes, the the air pressure within the tank will go up and down, which causes outside air being breathed in and out all the time. This effect is greater when the tank will be emptier. A full tank is preferable in many ways : less risk of water in your fuel or an empty tank just when you need your engine !